Visit Yorkshire in the north of England, one of the most popular tourist regions in England. There are tons of things to do and places to see. It’s many attractions include fishing villages, historic cathedrals. and breathtaking countryside. (We’ve split it up into sections: York, the Coast, Yorkshire Dales and Other). The ancient city of York dates from before Roman times. It was a major city during Viking times and then a major centre of Christian Britain. We start with the jewel in York’s crown, its Minster (or cathedral), worth a visit in itself. It’s full name is The Cathedral and Metropolitical Church of Saint Peter in York, and is one of the largest of cathedrals in Northern Europe. (Although a cathedral, it is officially a ‘Minster’ as it was also home to a community of monks). One of it many attraction is its Rose Window which was destroyed by fire in the 1980s. Each piece of stained glass was lovingly restored. Dating from the 11th century the castle is also known as Clifford Tower. This ancient street was the old butchers area of the city. Most of its overhanging buildings date from the 14th century and are a real taste of medieval England. The town of York is surrounded by an old city wall with gates, or ‘bars’, such as this one. We have a post dedicated to York here for more info: The Best Places To Visit In York. The Yorkshire coast, along the East coast of northern England, is home to several Victorian era resorts and pretty fishing villages. Scarborough’s the largest seaside resort on the East coast of Yorkshire. Home to two beaches and several amusement arcades, it’s a popular place in summer. You can also the popular Scarborough Fair, which inspired the famous song. Whitby is an iconic seaside town that has a long history of fishing and exploration. (James Cook, the British explorer, was born near here). Its built around a pretty natural harbour, home some of the best fish and chip shops in Yorkshire. You’ll also find several quaint shops, excellent restaurants, and historic architecture. It’s also overlooked by Whitby Abbey (pictured) inspiration for Bram Stoker’s Dracula. Staithes is another pretty fishing village with a pretty harbour. You can also visit the popular beach in Staithes and see why it was a popular with the young Captain James Cook. Many of the locals work in the fishing and boating industry in the harbour. The Yorkshire Dales (or ‘Dales’) are a highland area in the west of the county. They’re home to rivers which each form a valley, or ‘dale’, named after the river. So Swaledale is the valley of the River Swales, Wharfedale is home to the Wharfe and so on…(The River Ure is the exception. It’s valley is Wensleydale). Close to the serene River Wharfe is the beautiful Dales village of Burnsall. Also nearby is Barden Tower, historic Bolton Priory and Aysgarth waterfalls. One of many pretty hamlets dotting the Yorkshire Dales. Hardraw Force is a waterfall on the Hardraw Beck in Hardraw Scar, a wooded ravine just outside the hamlet of Hardraw, north of the town of Hawes, Wensleydale. A pretty small waterfall near Malham, a popular village in the Dales. 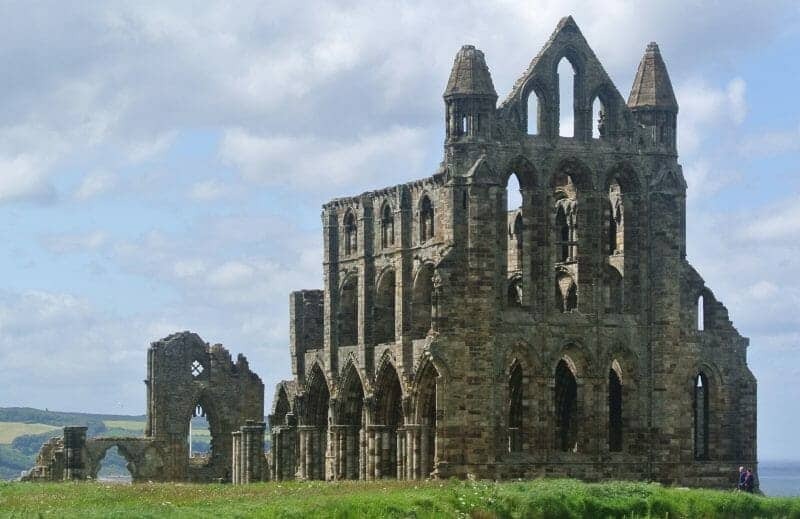 The Abbey, founded in 1120, is now in ruin – and has been since the Dissolution of the Monasteries in Henry VIII’s time. Castle Howard is a stately home in North Yorkshire, England, 15 miles north of York. It is a private residence, and has been the home of the Carlisle branch of the Howard family for more than 300 years. It’s not a true castle, but this term is also used for English country houses erected on the site of a former military castle. It was used as the fictional “Brideshead”, in both the TV and recent movie of Evelyn Waugh’s Brideshead Revisited. Haworth is a pretty village near Bradford. It is most famous as the former home of the Bronte sisters Anne, Charlotte and Emily. You can visit their former home, the Bronte Parsonage, now a museum. And wonder the local moors, inspiration for much of their writing. This is one of the most popular national parks in the UK, particular with walkers. It has heath, woodland, majestic sea cliffs and several pretty villages to explore. If you are a literary fan, then you will love to visit the little village that author James Herriot, called home. Thirsk is between North York Moors National Park and Yorkshire Dales and so is a great base to explore both. A pretty market town on the River Nidd in North Yorkshire. As well as the viaduct it’s also famous for the spectacular Mother Shipton Caves in the town.